Communications are essential - in-person, digital, print, and phone - for promoting and securing legacy gifts. Develop or improve your materials. Leave with a "to do" list. A survey of predicable and unusual issues and situations planned giving officers should be prepared for: committees, policies, collecting bequests, evaluating unusual gifts, donor imagination and more. To be a successful fundraiser, hit your required metrics, and produce more results with less resources, you must be more creative and flexible with your ask strategies, Discover eight proven methods to close gifts faster. Strategies to make donor cultivation and stewardship events inspiring, memorable and well attended. 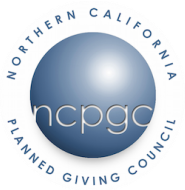 How do you create a major/planned gift program in an annual gift culture without dropping the ball on gifts to support the annual budget? A fresh approach to planned gift marketing that takes into account the habits, trends and interests of the ever changing planned gift prospect. We'll use a marketing perspective to enhance the most common strategies, and offer fresh new ideas for your programs. .
A CPA may know your donor in a very unique way. Learn about this relationship along with the role a CPA can play and how it affects you as a gift officer. Learn how to use your fundraising database as a powerful tool to track, measure and improve your prospect interactions, productivity and fundraising results. The evolution of responsible and sustainable investing (SRI/ESG) over the past 20 years, where it is heading, and why it has become so relevant to donors and foundations alike. Learn about the different principles followed by Development and Finance when it comes to planned gifts and best practices for working together. This session will include tips for overcoming obstacles as well as case studies to illustrate some unconventional real estate gift structures, with the objective of helping you push more of these gifts over the goal line. What Can We Do With Those Old Restricted Funds? This workshop will explore the circumstances under which charities can change the terms -- weather management terms or the charitable purposes -- of a restricted gift. This workshop addresses legal (including fiduciary law) and tax issues involved in structuring investments held in a charitable remainder trust. Gift planning in a no-estate tax environment, use of revocable gifts, and a few odd-ball gift assets. The right charitable vehicle for a donor's philanthropy depends on their goals, needs, and objectives. Each charitable vehicle offers different advantages and should be carefully selected to correctly support a donor and his/her philanthropy. .
Analyze actual gift situations to explore when and how to use certain giving techniques creatively (CRTs, CLT,s, gifts of remainder interests, outright gifts and gift annuities). What do prospective donors care about most and respond to best when being approached for a planned gift? Experienced philanthropist answer that all-important question.